Oh my goodness- I am so sorry I have dropped off the face of the earth the last week and a half! But now we are back to reality and amazingly GORGEOUS weather that is the 70’s and 80’s!! All of the flowers are in bloom (I will do a garden tour later this week!!) and I am back in the kitchen! Which brings me to this brand-new recipe and video I have for you! This is an updated allergy-free version of my old favorite stand-by (PRE-ALLERGY) recipe for Raspberry Buttermilk Cake. And this cake is so good, you won’t even realize the difference! And I love that it is so easy and a little less sweet so it could work for brunch, and afterschool snack or an easy weeknight dessert! Preheat the oven to 350 degrees and prepare a 9" round cake pan with coconut oil and a parchment round. In a small bowl combine the coconut milk and vinegar and set them aside. In a mixing bowl combine the dry ingredients and then add the vanilla and coconut oil to the coconut milk/vinegar combination. Add the wet ingredients to the dry ingredients and whisk until smooth. Fold the blueberries into the batter gently. Pour the batter into the prepared pan and smooth to the edges. Bake at 350 degrees for 25 minutes and then let cool before turning out onto a cake plate and sprinkling with powdered sugar of desired. 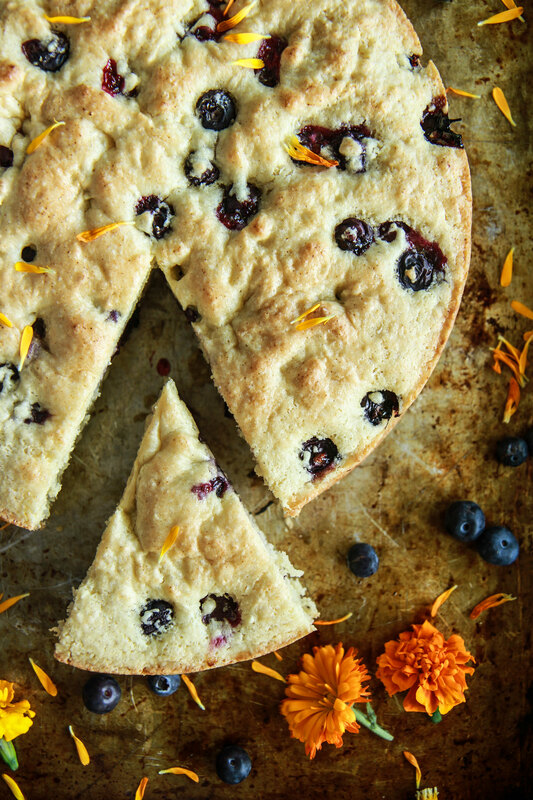 Ohmygaaaawsh I could eat this cake for breakfast (or snack or dessert) every single day! I love the “buttermilk” method using coconut milk and cider vinegar – it’s so amazing how closely it mimics real buttermilk. This is definitely on my To Bake list!! Sounds super yummy and easy! 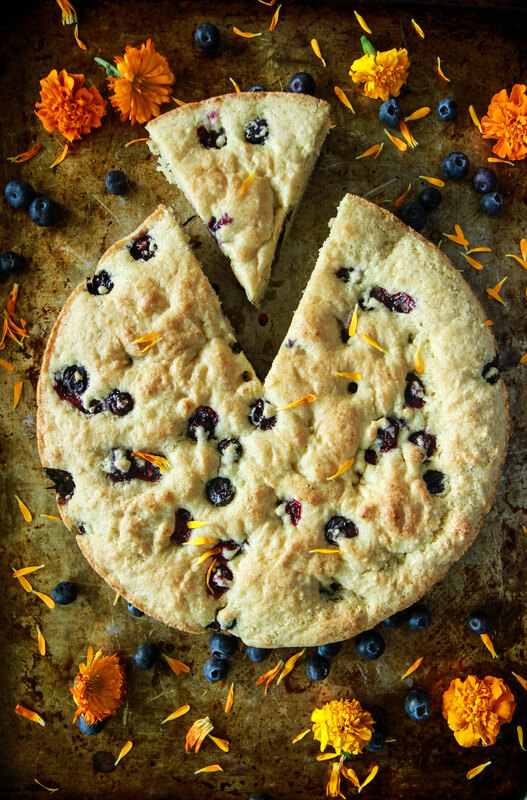 Cannot wait to give it a try… when do you suggest adding the blueberries? Sorry! I added that to the directions! 30 mins until I can eat cake? Sounds too good to be true!! FYI doesn’t work with BRM 1 to 1…threw the whole thing out…I don’t like BRM All Purpose (has a bean flavor,) any suggestions for a good sub that will work? i had the same result. i used BRM GF flour — had to throw the whole thing out. it LOOKED great though. haha! Rachel, I feel terrible! do you mean you felt that it had a bean flavor from the flour? or that it didn’t bake right? OH NO!! If you add vanilla extract to it can you still taste the bean flavor? GORGEOUS cake. Perfect for brunch or dessert! How fun is that! And I love the sound of this cake! Sounds great and most all easy and fast, will try this weekend. Hope to hear what’s up with Coco soon! Could I use almond flour and if so, how much would I need to use? I really want to make it sugar free. Thanks!! Hi Jennifer- you can certainly try, but I designed the recipe using the ingredients lasted, so I am afraid I am not sure how the substitutions will turn out. Would this work as a cupcake for kiddos…or is it more muffin texture? Can’t you substitute the xanthum gum? Hi Karen, I am not sure what you would sub the xanthum gum for? You can omit it, but it will not have the same texture. Welcome back, missed your unique recipes. This one looks real yummie. Check the pkg, but I think Bob’s Baking Flour has some xanthum gum in the ingredients. But maybe not the one you used. If so, maybe a teaspoon would work? What do you think? I used Bobs Red Mill All Purpose Baking flour which does not have xanthum gum, but the 1:1 does! About the flour, i found using half of the BRM 1-1 flour and half almond flour will give it a good texture and not have the ‘beany’ flavor. I do that when making gf Challah.